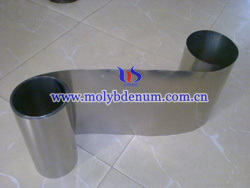 Molybdenum molding methods - metal powder continuous rolling molding is using a special powder hopper to put the raw material into the special roll, rolling into a certain thickness and strength continuous long strip blank, and then continuously through the pre-sintering. After pre-sintering there should process second and third rolling and heating, and finally processed into a certain porosity or compacted powder metallurgy strip. The advantage of continuous rolling is that it is possible to produce an unrestricted sheet material having a certain thickness or a wire material having a diameter within a certain range. The process can be roughly as follows: powder feeding - rolling forming - rolling plate sintering and other major processes. Which is different from the general compact metal rolling, it is significantly reduced by the powder volume to occur powder particles elastic and plastic deformation, so the powder forming relies on the powder particles mechanical mesh or added organic binder bonding and without sintering the strength of the billet is very low.